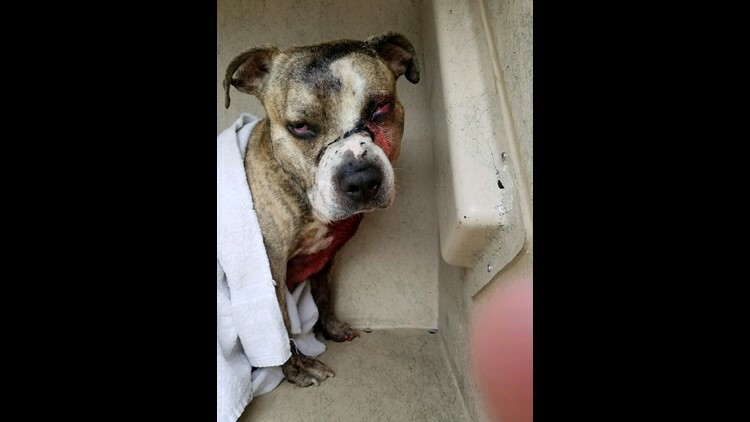 INDIANAPOLIS – The first time Tim Elliott saw Winx, the pit bull was whimpering in the corner of a post office, shot in the face. 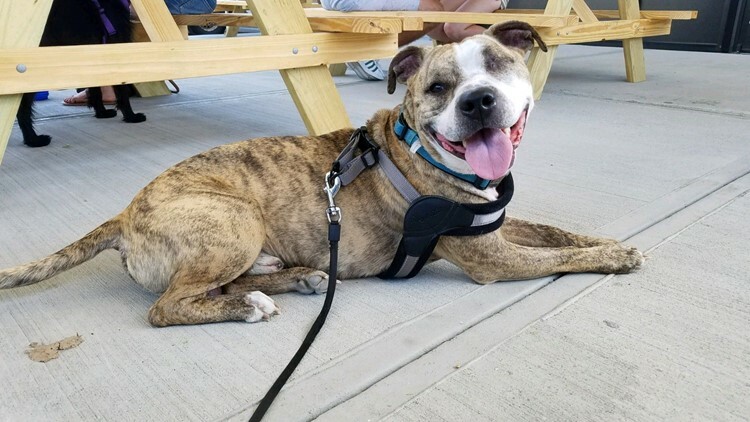 Now, several months – and surgeries – later, the dog has been officially adopted by the Indianapolis Metropolitan Police Department officer and his wife. Elliott encountered Winx on May 9 bleeding from a gunshot wound and doused in what he later discovered to be bleach. "When I actually came in there, he wagged his tail, got up and came to me, and then just kind of collapsed by my legs," he said. Indianapolis Animal Care and Control retrieved him, but Elliott didn't stop thinking about the dog. He and his wife, Tiffany, visited him the next day and decided to foster Winx at home as he recovered. More: Woman finds dog without a tongue. "We knew we were going to adopt him as soon as we brought him home," he said, "because he made this his house. ... He pretty much made the decision before we did." Nursing Winx back to health was no easy task. He needed to be hand-fed expensive canned food, administered eye drops and medication and required three surgeries, including one to remove his left eye. Money raised via GoFundMe has offset the cost of Winx's food, other supplies and ongoing medical care. Anything left over will likely be used to buy toys and other supplies for Indianapolis Animal Care Services, Elliott said. Elliott said he has seen Winx come out of his shell over the past three months. He has become a curious and playful but protective pet, making what could be considered a gruff first impression with visitors. But his growls quickly become begs for affection because all Winx wants is to "be loved on." "He follows us around like our shadow," Elliott said. Winx sleeps with a brown bear chew toy (his "Wubba") and plays with his furry siblings: a German shepherd named Porter, another pit bull named Gauge, and cats Remington and Ryder – all rescues. "If we had a bigger house and more land, we probably would have, probably, a couple dozen dogs and (an) ungodly amount of cats if it was up to my wife," Elliott joked. Winx wasn't the first dog Elliott has come across on the job, nor will he be the last. On a typical day, Elliott and his beat partners receive at least two calls about stray dogs. "I keep dog leashes, treats in the trunk of the car," he said. "Then I'll either drive them to animal control because they're so busy, or they'll just ride with me all shift until they can come pick them up." He said it's "heart-wrenching" to respond to a call of a severely injured animal. "Why would anybody do this to an animal?" he said. "Even if it is 'aggressive' or 'mean,' as everybody calls in and says, they do still have a soft spot. Like people, you've just got to find what they like and build from there." Although it's been a journey, Elliott said he and Tiffany are excited to officially add Winx to their brood. "He's very thankful that he's here," he said. "You can tell."